Massive range, entertaining interior, comfortable surroundings, darn good manners and surprisingly good handling. Add a sunroof that is utterly devoid of wind noise when open, and you’ve got a great long haul cruiser. Let’s just ignore the budget hypocrisy, shall we? While Jake was spending some alone time in the rear seat of the A8, I was cruising behind the wheel of a new Bentley Flying Spur. 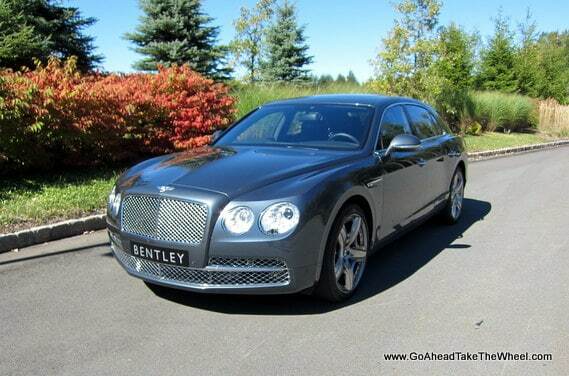 While it’s no Bentley Mulsanne, or Rolls Royce Phantom, I was treated to $243,835 of Bentley luxury. And while the 6 liter W12 engine can propel the new Flying Spur from 0-60 mph in 4.3 seconds, you’d never know that unless you timed it because the environment inside the Flying Spur remains calm, and quiet, isolating its occupants from what’s happening in the world around. 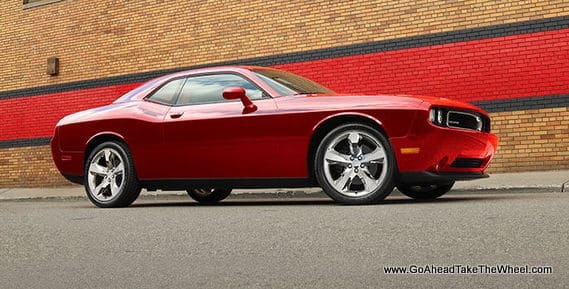 Jake Gulick – Dodge Challenger. Now, I’ll readily admit that this car is a leap ahead of the dinosaur from the 70s that was all engine combined with horrifying handling and braking, but I would have thought that in the 40 intervening years somebody would have figured out that a seat that’s not a glorified pin cushion was not only possible, but highly desirable. And I swear it’s BIGGER than the original. The colors remain 70s shockers as well. This car is just too big and heavy for my tastes when it comes to taking it on the track. And since it’s been around for several years, I’m kind of bored of the styling too (inside and out). I am a fan of the sound and power that comes out of the Hemi V8s, whether it’s the 5.7L in the R/T or the 6.4L in the SRT. Jake Gulick – Chevy Camaro SS 1LE. I’m often befuddled by Chevy’s option codes and model designations, but one code I know: Z/28. We saw the upcoming Z/28 at its debut this spring at the big ‘presser’ at the NY auto show, and the engineers pounded home their attention to weight loss. Which is good, because while the SS is a potent machine, quite drivable, and it’s certainly very capable, it could stand a nip and tuck here and there. 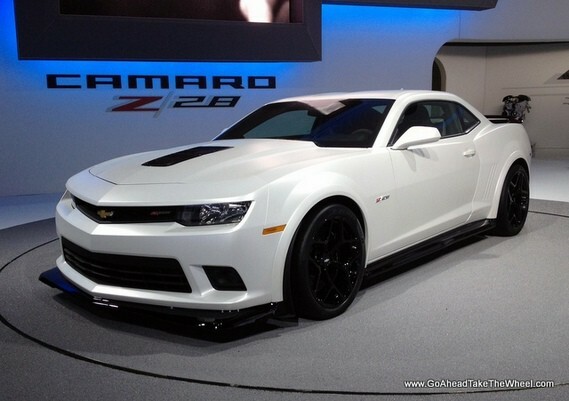 Don’t get me wrong, for a heavy car it’s pretty darn good, but yea, bring on the Z/28. Nate Lichaa – Although the Camaro SS 1LE has been updated and has gone through some changes for 2014, it drives pretty much exactly as I remember from our 2013 Camaro SS 1LE test car. I love everything about the way it feels when I drive it, from the sonorous exhaust note, to its very capable handling. I even prefer it over the ZL1. But if you’re willing to sacrifice some on road features for a more road racing abilities, the Z/28 will be the new rock star in the Camaro lineup. Bring it on!!! Jake Gulick – BMW M6 Gran Coupe. I think the Germans are out to show us they have a sense of whimsy. Their Coupe has four doors. (But a rakish roofline, so it’s a Coupe. Sure it is.) The last gen M6 I drove felt like it was laden with anvils and black holes. Wooden even. This M6 pushes the scale even higher, but wears some kind of Harry Potter slimming outfit, so as to fool you that it’s lighter. Kudos for that bit of sorcery, but in the end, it felt as though I was driving an avatar. Fast, of course, (560 hp) with a great audio track, but it felt somehow disconnected. I had to give this one to the E550 Cabrio over the M6 Gran Coupe, partially because it’s a convertible, and everyone will see you when you’re driving it. It actually is a really nice car too. It’s 402 hp 4.6L bi-turbo V8 Engine is plenty potent (0-60 mph in 5.0 seconds), and there’s also a usable rear seat. 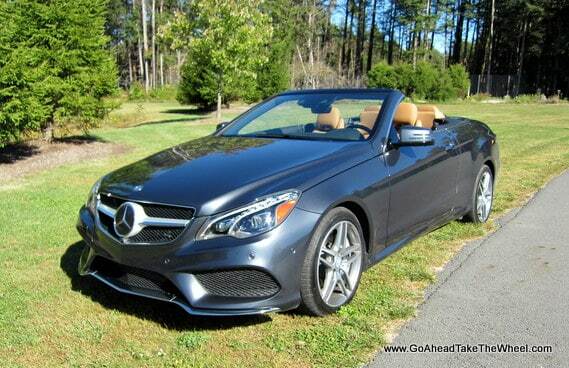 It’s not the flashiest of cars, but it’s a four season convertible that you can drive all year long in comfort. Everything about this car feels solid and it reeks of quality all around. Starting at MSRP $67,300, it’s not cheap, but on the road, it also does not disappoint. Jake Gulick – Jag F-Type S.
When we saw the F-Type introduced at the Detroit show a year and a half ago, we nodded in proper reverence. It looked like a Jag, but not a rehashed “heritage” Jag. But, it was a Jag, so skepticism was in order. “Lets wait until they deliver real cars before we get too excited,” we opined. Well, it’s here….Four words describe the real thing in the flesh and on the road. Grand slam home run. No car in distant memory has knocked me out in the first 30 seconds like this one. Oh sure, it has 495 HP. It drives like it should be called the N-Type, so far is it beyond its E-type predecessor. The proportions and body are nearly perfect, especially from the back. And the interior is smartly rendered in supple leather over firmly bolstered seats. But, just one listen to the snap, crackle and pop of the exhaust will convert even the most ardent of critics. Top-down glorious music. Go find a tunnel and drive through it back and forth just to revel in the auditory delight music. I want one. Only 105,000 reasons stand between me and nirvana. Nate Lichaa – I agree with Jake that the F-Type S is a grand slam home run for Jaguar. 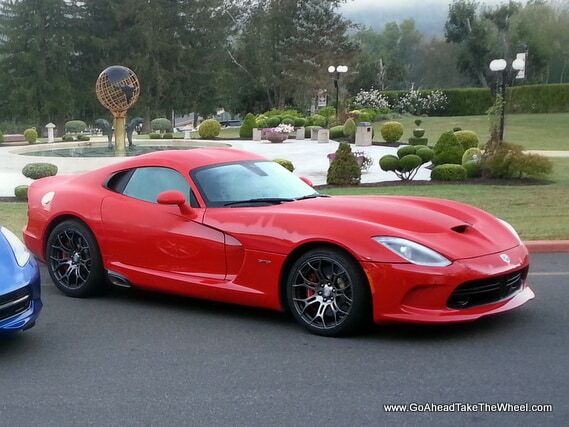 This car is thrilling to drive and leaves an immediate and lasting impression. The supercharged 5.0L V8 bolts from 0-60 mph in just 4.2 seconds. The engine sounds incredible, the exhaust crackling and popping further enhance the acoustical experience. The transmission shifts are lightning-quick and its handling is superb. I was never a big fan of Jaguars in the past, but they’ve been coming out with some fantastic cars lately. 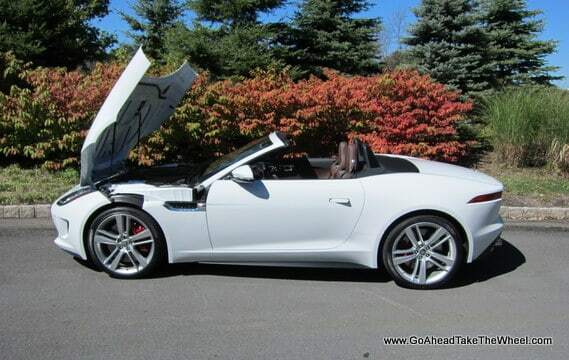 The F-Type is my favorite one of all. Jake Gulick – C7 Vette. Thanks to our Congress for this one. The jury is out on its looks, with critics citing it’s cartoonish tailights and lower grill “fangs” as being over the top and too busy. Look beyond that. Look at the spec sheet. 500+ HP. Huge flat torque available all over the place. Dry sump oil system (! ), Trans coolers, and diff coolers. A diff controlled by more processing power than we had on Apollo 11. Then look at the price sheet (before dealer mark-up). Thats a lot of stuff for not a lot of money. Now take it to your favorite track, or your favorite back road. That’s when the price looks bargain basement cheap. This is a proper car, a street-car with racecar manners. Or is that a racecar with street car manners?? Regardless, it is eons ahead of the C6. And it’s no one-trick pony. Explore the sub menus beyond the driving modes. Delve into the myriad of damper changes and traction settings. Yet, even with what must be a crazy supercomputers worth of processing power jammed under its tight skin, I never once thought about the fact that I was driving anything but a mechanical marvel. I never noticed I was cruising on a 4-cylinder engine. Never thought that some grumpy factory engineer was slapping my wrist for my over exuberant right foot. No, this thing flat hauls around a track, and does everything I want. It positively launches out of corners, as if it’s on cogs. And turn in is brilliant. Looking at the price after a track session is laughable. I don’t know how the General makes a profit, but I sure am glad our government stepped in when they did. 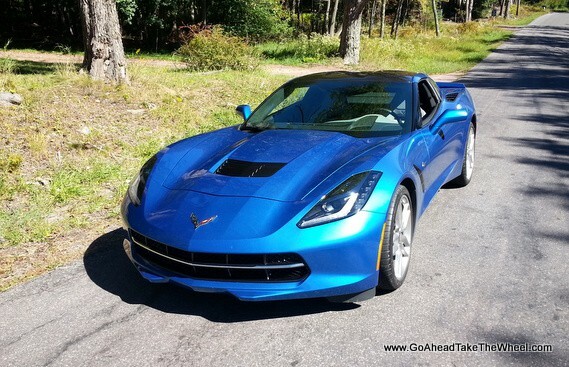 It’s amazing what Chevy engineers and designers did with the C7 Stingray. To me it looks gorgeous (taillights included). And not just that, it has the performance to back it up too. Like Jake said, it performs well on both the street and the track and makes you wonder if it’s a street car for the track, or is it a racecar for the street. It truly straddles the line that closely. The quality of the materials and the comfort inside the cabin are far better than the C6 it replaces too. With a current six month waiting list to pick one up (at the time this article was written), and with dealerships marking the sticker up as much as $25,000, this is a car that you’re probably better off waiting until the excitement slows down before purchasing one. But if you are one of the few that gets one early, this is a car that you’ll want to show off to everyone, and everyone will want to check out. For an indepth look at the car and its styling, read our article here. This car is unbelievably fast, loud, and obnoxious (not that there is anything wrong with that), and it feels like it should come with a warning label that says “For Track Use Only”. I only got to take this car for a lap around the track and walked away with a whole new respect for the SRT Viper and how much performance this car can deliver. It’s much more capable than most drivers are, it’s less forgiving if you make a mistake, and it will probably take a long time to master how to drive it to its fullest potential. 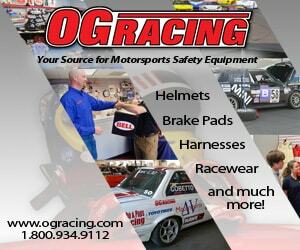 This car is most suitable for those with a higher level of track experience and unlimited access to a race track.